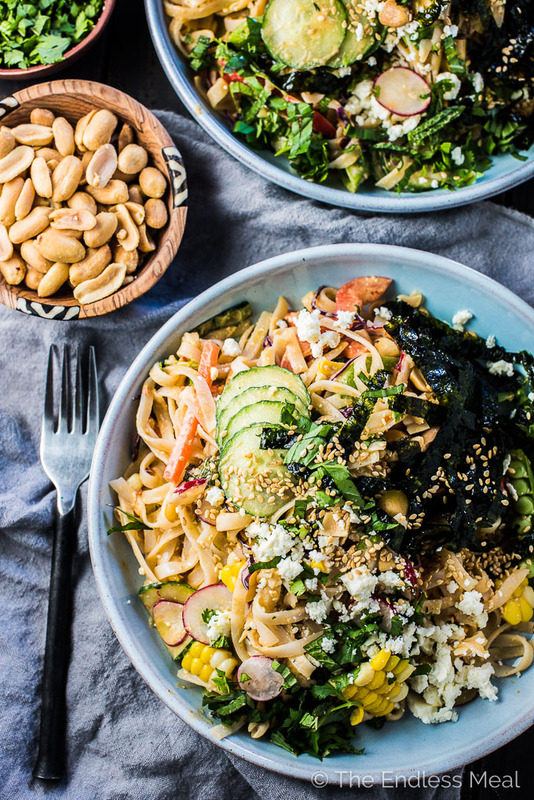 This healthy Thai Noodle Salad recipe is smothered in a crazy delicious Feta Peanut Dressing and loaded with fresh summer veggies. 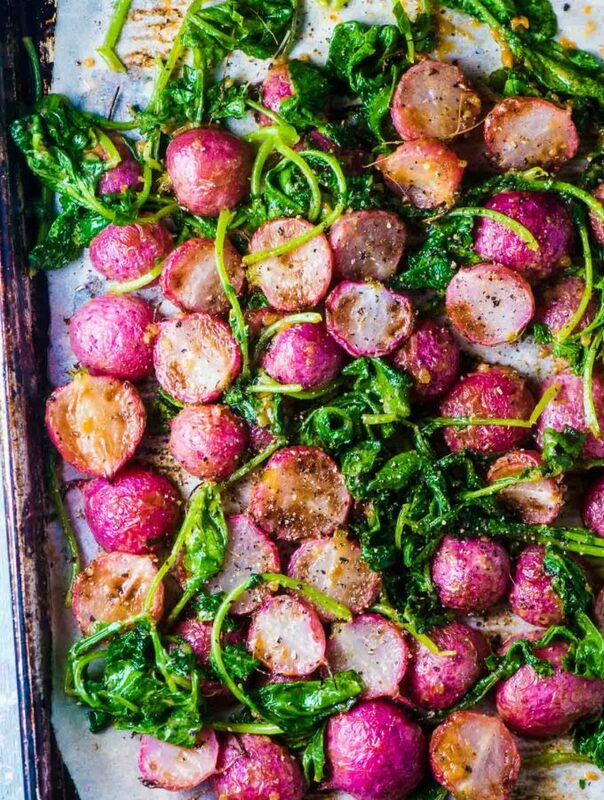 It's an easy to make vegetarian main or side dish that can be served hot or cold. You will LOVE it! Tell me you guys are all over Thai Noodle Salad as much as I am? ? I'm talking about those soft rice noodles smothered in delish peanut dressing. I know you know what I'm talking about. Fist bump coming atcha. But wait! I've done something a little sacrilegious and totally not Thai. Are you ready for it? I made the peanut dressing with FETA cheese. That is a true story. It's also (IMO) the only way peanut sauce should ever be made from now until the end of time. In this recipe, Feta cheese replaces the traditional salty soy. It makes the peanut sauce extra creamy and delicious. #heartmelts #swoon Hashtag all the love emojis. Quick sidebar → Have you ever wanted to go to cooking school? (I'm seeing a sea of raised hands ✋✋✋) When you're buying your Tre Stelle Feta for this recipe, make sure you grab one of the specially marked tubs and enter their contest for a trip to The Tre Stelle Cooking School! I'll tell you all about that in just a minute. You're going to simmer the sauce with some water and a little brine from the Feta container to bring all the flavors together. The sauce will have all these little bits of Feta deliciously floating around in it. It's amazing. 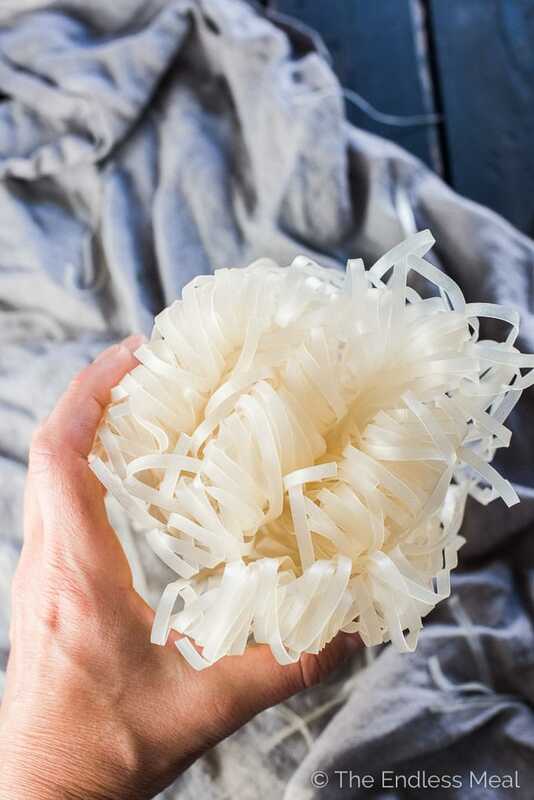 When you're buying the rice noodles, make sure you pick some that are wide-ish ribbons. The tiny vermicelli noodles are more common, but they're very delicate. I find it hard to toss the noodles with the sauce and veggies without the noodles breaking if I use vermicelli. Once you've made the Feta peanut sauce, you're going to cook the corn and the noodles in a big pot of boiling water. Time-saving tip: put a pot of water on the stove and cut all the veggies while you wait for it to come to a boil. When the corn and noodles are finished cooking, rinse the noodles under cold water then toss them with all the veggies and the sauce. So easy! Tre Stelle is throwing The Great Canadian Cheese Sweepstakes, which not only has amazing prizes but also the best name ever. From now until August, look for specially marked tubs of Feta or Bocconcini. Enter the special code on your tub of tasty cheese and cross your fingers. Tre Stelle is offering over 150 prizes and not one, not two, but THREE grand prizes. That's a lot of grand prizes! Three winners will be able to take a friend on a trip to the Tre Stelle Niagara Cooking School. If you win, will you take me? Pretty please! Find out more details and enter their contest here. 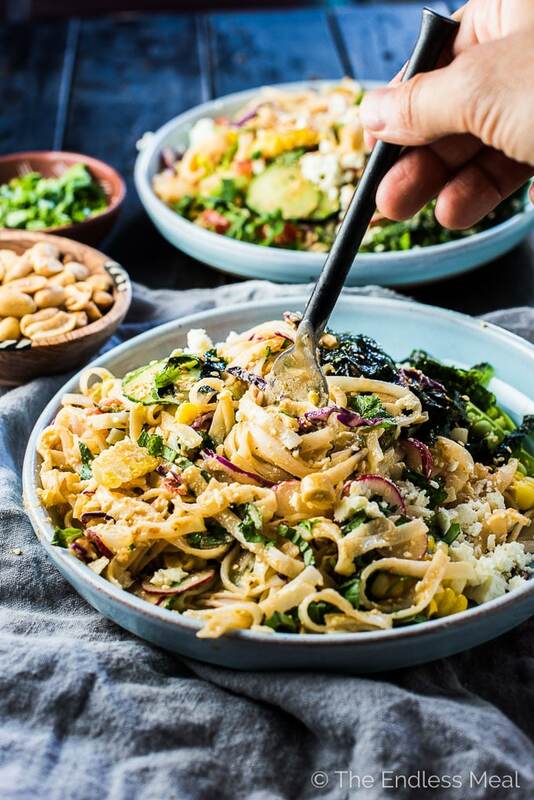 This salad that is really like a big bowl of pasta is everything summer dinner dreams are made of. It's light and fresh with tons of crisp veggies. There's sweet corn, crunchy carrots, spicy radishes, bell peppers, and cucumbers. The whole crunchy veggies mixed with the soft peanut-y noodles is the best combo. It's loaded with herbs like mint, Thai basil, and cilantro which brighten up the whole dish. It's loaded with herbs like mint, Thai basil, and cilantro which brighten up the whole dish. Then it's topped with chopped peanuts, some sesame seeds, and strips of nori. Or … you can scrap the toppings, use the veggies and herbs you have on hand, and it will still turn out amazing. This is a really flexible Thai Noodle Salad Recipe. 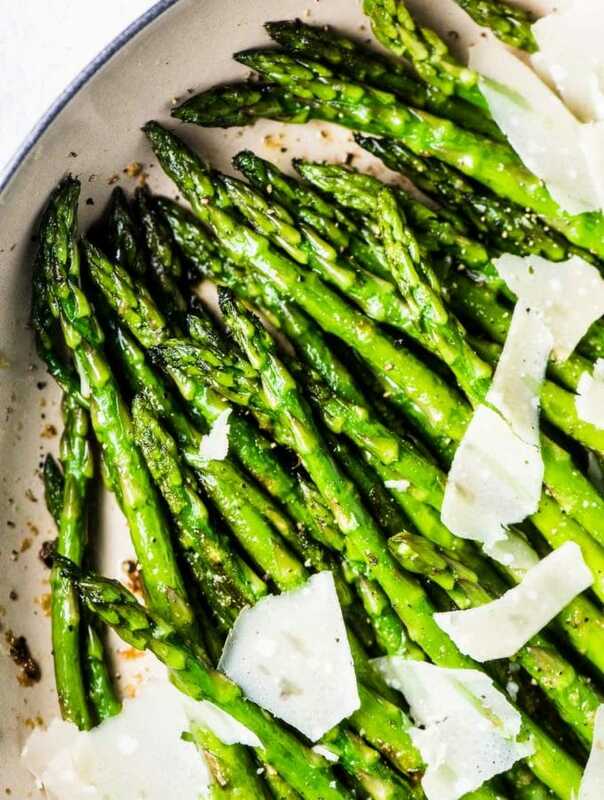 While I wouldn't recommend messing with the sauce, you can easily add more or less of any of the veggies, add ones that aren't on the list, or leave out ones you don't like. Basically, this recipe is: Sauce + Noodles + All the veggies you love. If you make this Thai Noodle Salad with Feta Peanut Dressing make sure you snap a pic and tag #theendlessmeal on Instagram so I can like and comment on your photos. I love seeing TEM recipes you create! Place all the Feta Peanut Sauce ingredients into a small pot over medium-high heat. Bring to a gentle boil then whisk until creamy. Note: the sauce should be a lot thinner than you think it should be. If it's not, add some more water. It will thicken up considerably once you add it to the noodles. Bring a large pot of water to a boil. Add the corn and cook for 7-8 minutes. Remove the corn from the water with tongs. When the corn is cool enough to touch, cut the kernels from the cob. Add the rice noodles to the water and cook according to package directions – usually 6-7 minutes. Drain the noodles and run under cold water to cool. Place the noodles back into the pot. Add the corn and all of the remaining ingredients. Pour the Peanut Feta Sauce over top and gently mix so everything is well combined. Add up to 1 cup of water (a little at a time!) to loosen the sauce if the noodles seem too dry. Serve the Thai Noodle Salad with any or all of the toppings. Wow, that looks wonderful. I love peanut sauce. Oh my gosh! I just made this tonight and it was AH-MAZING. Even my 3 year old loved it. I subbed almond butter for peanut and didn’t have any Thai basil, but it was still delicious. The mint was a delightful twist. I’m so happy to hear you and your family liked the recipe! Hooray!! Yum, this looks so delicious. I love the idea of using feta in the dressing. That’s genius. Can’t wait to make this. Thank you so much! It really does work well in this recipe! 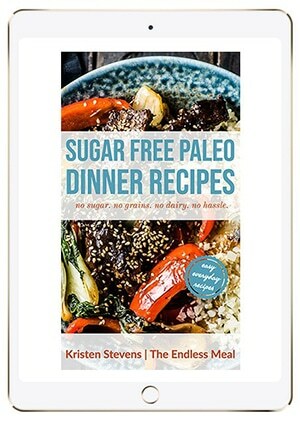 Kristen, I would love you to add calories, protein, carbs, etc for a portion. I track everything since my heart attack for my dietician and it would save having to calculate all of your wonderful recipes.